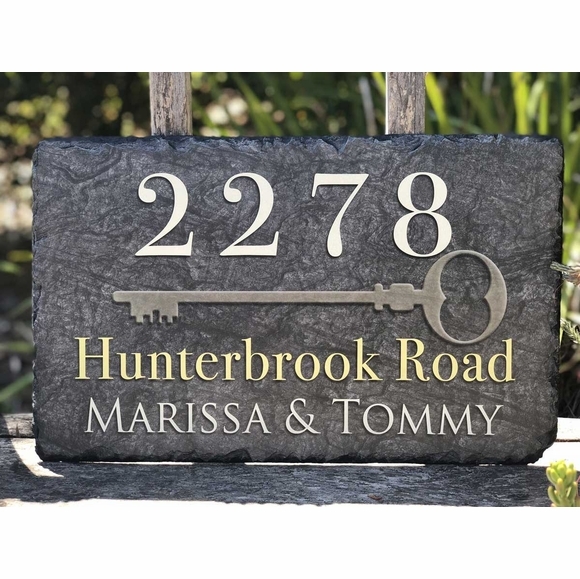 Slate Address Sign with House Key - - this distinctive slate plaque makes it easy for people to see your house number from the street! Made in USA. Features a large skeleton key stretching across the center of the sign. Three-line slate address sign with room for the house number, street name, and family name. Line 1 for the address holds up to four (4) numbers. Line 2 for the street name holds up to thirty (30) characters. Line 3 for the family name holds up to thirty (30) characters. NOTE: In this version of the key sign, the house number is on the top line above the key. If you prefer to have the family name on the top line above the key, please click the top link in Related Products. Color: slate gray with cream & yellow characters. Address number in large image above: 2278 Hunterbrook Road.